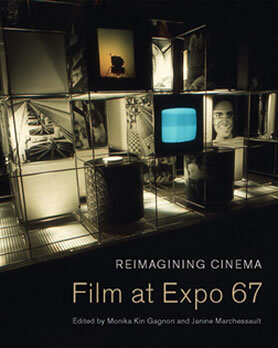 Reimagining Cinema, an anthology of essays, interviews and 130 colour reproductions of Expo 67’s most spectacular and inventive multi-screen films, published by McGill-Queens University Press. Expo 67, in its utopian aspirations, invited artists to create the world anew. What distinguished Montreal’s exhibition from previous world fairs were its dramatic displays of film and media, transformed into urban and futuristic architectures. Reimagining Cinema explores the innovations that film and media artists offered Expo audiences and presents extensive visual material to reconstruct the viewer’s experience. At the pinnacle of a new global humanism, cinema was expanded beyond the frame into total environments, multi-screens, multi-image and 360-degree immersion – experiments often seen as a harbinger of the digital age. Taking this expanded cinema as a starting point, the contributors focus on eight screen experiments, and employ innovative methodologies to reveal the intricacies and processes of production, while including factual descriptions, interpretive essays, interviews, and image dossiers. The book reflects how the Expo 67 film-events were encountered as creative experimentations that resonated with broader 1960s arts and culture, and as institutional collaborations with artists. More displays of photographic, cinematic, and telematic technology were experienced at Expo 67 than in any other previous world exposition. Reimagining Cinema captures the complexity and imaginative fervour of this exciting period in film history. Contributors include Seth Feldman (York University), Monika Kin Gagnon, (Concordia University), Anthony Kinik, (Concordia University), Janine Marchessault, (York University), Gary Mediema, Chief Historian and Associate Director, Heritage Toronto (Ontario), Aimée Mitchell, Canadian Filmmaker’s Distribution Centre (Ontario), Johanne Sloan, (Concordia University), Donald Theall (Trent University).